Girl Group NATURE, Tickets of 2019 1st Fan Meeting ‘NATURE WORLD’ Opens on 30th. ‘Newly Rising Trending Girl Group’ NATURE, we are inviting LEAF to the ‘Nature World’! The ticket reservation of the NATURE’s first official fan meeting since debut is starting through online reservation site INTERPARK TICKETS at 8 pm on the 30th. 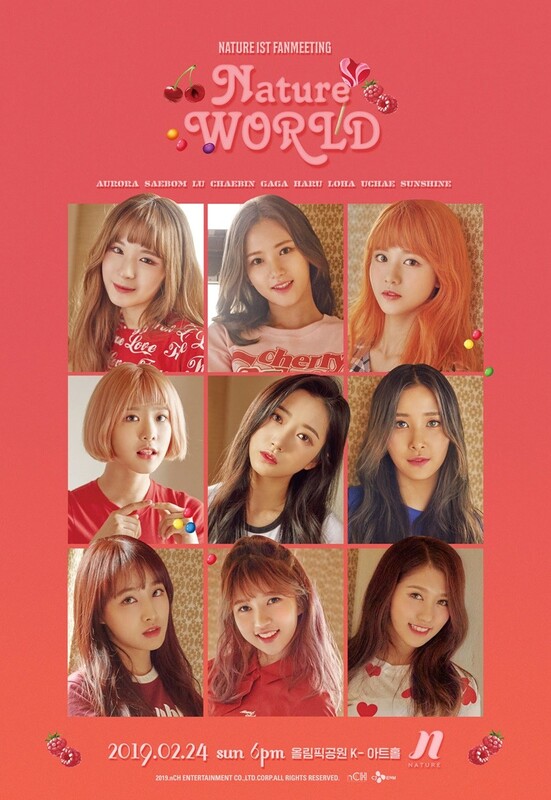 Previously, NATURE released the official poster of ‘NATURE WORLD’, which was filled with cuteness, and announced their official fan meeting event that will be held seven months after debut. This fan meeting is the first official fan meeting of NATURE, who debuted 8 months ago with the first single album ‘Girls and Flowers’ in August last year, adding extra meaning to the nine members of Nature and their fans. To give back to the generous love of the fans, NATURE members who prepared this fan meeting will have special moments with the fans with various events, performances, and special fan services. As it is the first official fan meeting since debut of NATURE, a newly rising trend girl group by starting their activity with the song ‘Dream About U’, the song next to their recently launched second single album ‘SOME&LOVE’, the fans; expectations are increasing more and more. Meanwhile, ‘NATURE WORLD’, the first official fan meeting of NATURE, will be held in K-Art Hall of Olympic Park in Seoul on February 24.